Annual precipitation (type, seasonal distribution): Precipitation is heaviest during the summer and averages about 50 inches a year, with a 280 day growing season. Maximum and minimum temperatures: Daily average temperatures are approximately 81 degrees F for July and 50 degrees F for January. Geology and Soils: Located within the overflow bottomland of the Santee River, one of the larger “red water” rivers of the Atlantic coastal plain. The soils and landforms are the result of this river’s action. The mechanics of river bottom geology are rather complex and are not addressed in the establishment record. Santee limestone underlies the region. 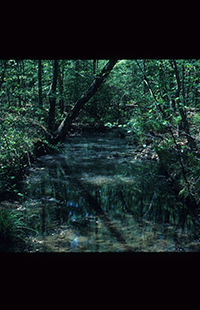 Aquatic Features: Alluvial river swamp. Although subject to flooding, the ground surface becomes dry during the growing season, a condition unlike most alluvial baldcypress stands. Drainage has probably become progressively better in this stand during the centuries since it was established. This may be due to silt deposition from floodwaters, or a shift in the river’s position and depth (point-bar building action by the river). Minor flooding throughout the year is no longer prevalent. This is due to the diversion of the Santee River by Lake Marion of the Santee cooper system. The climate is typical of the South Carolina low country. Plant Communities: Bald cypress and water tupelo, sweetgum (Liquidambar styraciflus), green ash (Fraxinus pennsylvanica), willow, water, and overcup oaks (Quercus phellos, Q. nigra, Q. lyrata), water hickory (Carya aquatica), sycamore (Platanus occidentalis) and willow (Salix caroliniana). Common Shrub Species: Styrax americana, Ilex verticilata, Itea virginica, Cornus stricta. Common Mammal Species: white tailed deer, raccoon, possum, bobcats, red fox, mink, weasel, gray squirrel, cotton tail rabbits. Bear are known to be in the area. Common Bird Species: A variety of songbirds winter in the area. Larger birds probably found are wood duck, turkey, wood ibis, and a variety of herons. Eagles have been observed in the area. Other: Cottonmouth, copperheads, and cane–brake rattler.